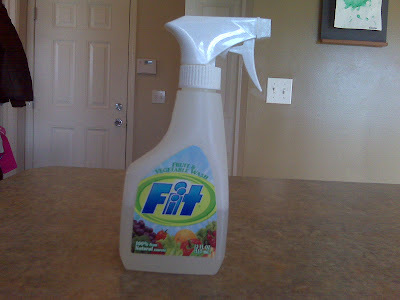 Have you ever used this Fit fruit/veggie spray? I bought this a while back because, unlike my husband, I actually want to WASH stuff before we eat it. And overall I've been pretty pleased. I don't feel as if I've eaten harmful pesticides and at least the food I prepare is a little cleaner. But, since I'm such a nice person I wanted to give you the whole scoop. I'm a giver after all. If by some chance your three year old decides to help you clean and wants to use this spray, go against your initial thought of "we eat it so it can't be harmful" and don't let her use it. Because what I found out is if someone sprays half a bottle of this all over the tile on the kitchen floor, the stuff is SLIPPERY. And it DOES NOT come up easily. At least I know the floor is pesticide free. Now I'm off to perform my rendition of "Dora On Ice."